Komatsu announced it is accelerating the development of smaller drills for opencast mining applications. 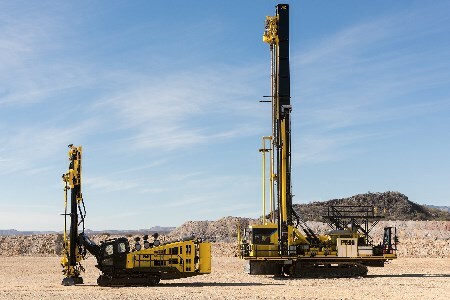 Furthering its commitment to be a full solutions provider to the mining industry, Komatsu is expanding its P&H product line to include articulating boom track drills. The first machine in the series, the 44XT, is now being tested at the company’s Arizona Proving Grounds prior to release later this year. The 44XT is capable of drilling 4 - 8 in. (102 - 203 mm) dia. holes using down the hole (DTH) percussive hammers. Komatsu introduced the 77 drill model at MINExpo 2016 and has since renamed it the 77XR to reflect its versatility for the rotary blasthole market. The 77XR was designed to accommodate the largest spectrum of blasthole drilling from coal to hard rock applications. The 44XT machines now in development will be for use in opencast mines and quarries, and are ideally suited for pre-split drilling applications. They can also be used for production drilling in smaller mines and large quarries, opening a new market segment for Komatsu.